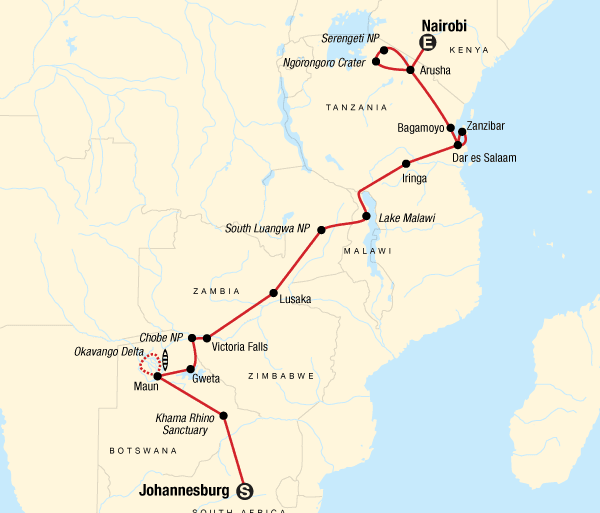 Connecting two major hubs, this overland journey will take you from Johannesburg to Nairobi and into the stunning wilderness of the seven countries that lie in between. Track Africa’s Big Five on safari drives in the Serengeti and Ngorongoro and head to the Okavango Delta for a wildlife walk and mokoro canoe excursion. Inhale the mists of Victoria Falls and the fragrant air of spice plantations in Zanzibar. You'll make your discoveries from a rugged Lando, ready to take on Africa. Combine this with bush camping, a social atmosphere, and a comprehensive itinerary and you have one hell of an adventure. This trip was one I will never ever forget! I made life long friends, did countless optional activities, and was so impressed with the tour guides! Trip of a lifetime. Once in a liftime spectacular experience. Highly recommend it. The trip was great and I experienced beautiful nature, saw many animals and made friends from all over the world! This summer has been incredible thanks to the hard work of GAdventures putting together an incredible trip that lets you get to see the amazing African animals we were lucky to see all of the big five! You get to actually meet the beautiful people from all the different tribes and cultures and have an insight into their world but the best part of the trip is you meet people who become friends for life, as you are all put together in the Lando and you become one crazy Gadventure family! A truly life changing experience! A great way to see Africa for the first time. Each day I found myself being blown away by the spectacular and constantly shifting landscapes. I never minded those long drive days because the Lando was extremely comfortable and offerred great views. I had several experiences that I will remember for the rest of my life. Only ground transport Lando (overland adventure vehicle), 4x4 safari vehicles, ferry, mokoro, walking. This trip is done a combination of vehicles - a larger 24 seat overland vehicle named the Lando for most of the trip, and in private 6-7 seat safari vehicles for the safari section in Tanzania. Both styles of vehicles have their advantages - the allows the entire group, including your CEO, to travel together, and sits higher, great for wildlife viewing and to enjoy the scenic landscape. The smaller safari vehicles will be used when the group is in the Serengeti and Ngorongoro Crater. With sliding windows and a large pop-up roofs, an open 360-degree view of area, great for wildlife viewing. If there is a large group, 2-3 vehicles will be used, and the group will be split up. This style of travel is by no means luxurious, but the seats are comfortable and having our own private vehicles allow us the flexibility of making stops when needed, and to stay and watch that crouching lion prepare for an attack. For your time in Zanzibar, please note that the overland adventure vehicle (OAV) will stay in Dar es Salaam, on the mainland. We use a large public ferry with in indoor seating area to cross to the island, and while there, our transportation will be in minibuses. Here’s a quick look at the unique features of the well-equipped G Adventures overland adventure vehicle (OAV): - Storage for your main luggage is accessible from inside the vehicle - Day packs can be stored at your feet or on the luggage shelf above - Onboard safety box for valuables - Front viewing windows and large sliding windows, both great for wildlife viewing - Reclining seats - Fully equipped mobile kitchen - Access to a 250L tank of drinking water - Air-conditioning - Charging station, when available in camp (South African plug - 220-240V) - USB charging ports for every traveller at their seat - Wifi in selected countries, depending on the network reception Please note that our Landos do not have on-board bathrooms. This is not a physically demanding journey; however, travelling can be difficult, with long drives and poor road conditions at times. Please take note of the travel times and distances in the above itinerary, and consider that this is often on poor quality, bumpy roads. Despite this, most clients feel that the diversity of the African landscape, culture and wildlife are all well worth the experience. Camping in Africa is truly an adventure. You will be able to get off the beaten track to get a first-hand experience of the beautiful wilderness and nature. While camping, we stay at designated campsites in national parks and outside towns. Campsite facilities in southern Africa are generally good, but can be basic in certain places. There are generally small restaurants and/or bars, washing facilities and occasionally telephones available. The camps have flush toilets, and showers at some camps are outdoors, having simple reed enclosures for privacy. Additionally, warm water is available at most sites, but it is not guaranteed to always be warm when you take your shower; the warm water may be used up others who also use the camp. We usually set-up camp within close proximity to the toilet facilities, though occasionally to reach them you may to walk a short distance. All camping equipment (with the exception of your sleeping bag and pillow) is supplied, including camp mattresses, which are warm and comfortable. We supply dome tents and assembly/disassembly takes only 5 minutes. They are good quality, durable, industry-standard 2-person safari canvas tents. Please note that most adults will not be able to fully stand up inside the tents, though most travellers find these more than adequate, as they have a base area of approximately 4 square meters. These tents are regularly treated with a waterproofing agent, but under certain rainy conditions, the tent fabric may become saturated to the point where seepage or leakage may occur. All tents have built-in mesh insect netting on the windows and doors. We travel with our own portable camp chairs with a comfortable back-rest, and we utilize our own cooking equipment to provide the group good quality camp meals. In camping within the national parks and conservation areas, some camp sites are enclosed for keeping the resident wildlife out. Other camps are open to the natural environment – care must be taken, especially at night, when a torch/flashlight is recommended when walking around the camp area. The campsite in Serengeti National Park is extremely basic, with no electricity, simple bathing facilities (no showers), and squat toilets. While camping at the Ngorongoro Crater rim, there is very limited electricity, occasionally warm showers, and both seated and squat flushing toilets. The campsites for the Serengeti and Ngorongoro Crater are open sites, where the wildlife can wander into the area, but they are safe. Despite the challenge that a few days “roughing it” may pose to some, the experience of being that close to nature, camping under the African stars, and seeing incredible wildlife at your tent door-step is not just gratifying but ultimately an experience of a lifetime. Guesthouse/Lodge/Bugalows 4 nights on Zanzibar Island we will stay in bungalows. Basic rooms, twin and multi sharing rooms with shared ablutions. Guides 2 Chief Experience Officers (CEOs) throughout as head guide/cook and driver, certified safari guides/drivers, local guides. 1. Please note that this trip is a combination of multiple G Adventures tours. As such, the staff and/or particular vehicles operating your tour may change between tour segments. You may also expect some group members to join or leave the tour, between tour segments. 2. This is not a physically demanding journey; however, travelling can be difficult, with long drives and poor road conditions at times. Despite this, most clients feel that the diversity of the African landscape, countries, culture and wildlife are all well worth the experience. We use a comfortable and safe customized safari truck for the long drives. 3. YELLOW FEVER According to the WHO and CDC, there is no risk of yellow fever in Botswana. It is compulsory to show a valid Yellow Fever vaccination certificate if you are travelling to Botswana from a Yellow Fever endemic country, or have recently travelled to a Yellow Fever endemic country (with entry stamps in your passport), including the following countries (but not limited to): Angola, Benin, Burkina Faso, Burundi, Cameroon, Central African Republic, Chad, Congo, Democratic Republic of the Congo, Republic of the Cote d’Ivoire (Ivory Coast) Equatorial Guinea, Ethiopia, Gabon, Gambia, Ghana, Guinea Zambia, Guinea-Bissau, Kenya, Liberia, Mali, Mauritania, Niger, Nigeria, Rwanda, São Tomé and Príncipe, Senegal, Sierra Leone, Somalia, Sudan, Tanzania, Togo, Uganda, Argentina, Bolivia, Brazil, Colombia, Ecuador, French Guiana, Guyana, Panama, Paraguay, Peru, Suriname, Trinidad and Tobago, Venezuela. 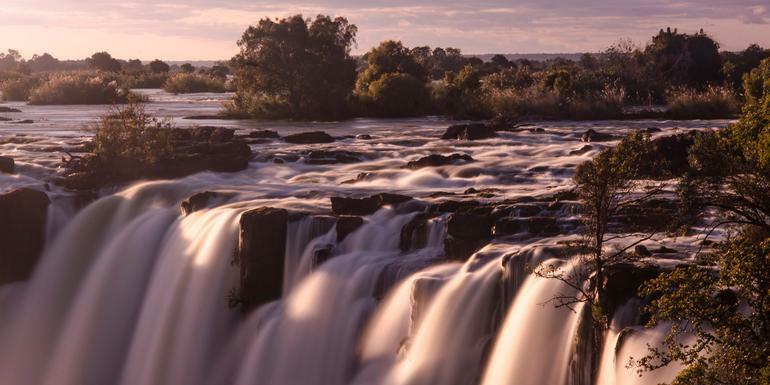 **We advise all travelers to Botswana who are coming from one of the above countries, or who have visited them in the last 10 years, to be prepared with a Yellow Fever vaccination certificate or letter from your doctor with proof of vaccination. Yellow Fever inoculations need to be administered at least 10 days prior to your entry into the country. Border officials in Botswana have been strictly enforcing these requirements. Travelers without the correct documentation run the risk of being denied entry, and will not be able to continue with the tour. (Any additional travel expenses will be on your own account.) ** 4. An essential part of your safari is participation. The group is usually divided into small groups and given different tasks which change on a day to day basis, from kitchen duty group (helping in prepare meals and clean up afterwards), the packing group (sets up all tables and chairs outside) and the cleaning group (which cleans the truck by emptying the rubbish bin and brooming). it is all part of your adventure and when everyone puts in a little effort the trip will run smoothly. Your CEOs will do all the meal preparation, but we do ask the clients to help with the washing up. Team spirit is part of the fun! All camping equipment (with the exception of your sleeping bag and pillow) is supplied. We supply dome tents and assembly/disassembly takes only 5 minutes. All tents have built-in insect nets. Mattresses are also available, which are approximately 4cm thick, warm and comfortable. 5. Sleeping bags can not be rented on any of our Africa overland or safari 6. Your CEO aims to provide you with the best service possible during your tour. They will be joining you in the back of the truck for a maximum of approximately 50% during driving, to answer questions and provide more information about the areas that you visit. They will spend the remainder of the driving time in front with the driver to enable them to make bookings, do planning and to fulfil other organizational requirements of the tour. During wildlife safari drives, your CEO will ensure to accompany you in the passenger area of the truck. This is of course because they have a lot of knowledge to share with you during these exciting wildlife safari drives. Please do not hesitate to ask your CEO any questions. 7. According to the lunar cycle, Ramadan will fall between May 5th and June 4th, 2019. Please note that Ramadan is a month of fasting observed by Muslims throughout the world, during which time the followers of Islam should not eat or drink between sunrise and sunset. In Zanzibar and other Muslim areas in Africa, it is important to note that there may be some limitations to services and disruptions to schedules during Ramadan. Generally our tours still operate effectively during this period and food is available to non-muslims throughout the day. It is important to display increased cultural sensitivity during Ramadan, particularly in Zanizbar. Please wear loose fitting clothes, that cover knees and shoulders, and try to avoid eating, drinking or smoking in public out of respect for those who can't at that time. 8. MONEY EXCHANGE We strongly advise that you bring ZAR or USD from your home country or exchange money before the start of the tour, to avoid delays on tour. Please see the Money Exchange section for more details. 9. DRONES The use of drones in national parks in Southern Africa is prohibited. As mentioned above, most of the meals on this tour are included in the tour price. When a meal is not included, this is because there are often many options available - we would like to give you the opportunity to explore a bit and test the local cuisine yourself. In these cases, your CEO will be able to suggest some good local restaurants or options for you to choose from. All included meals will be prepared from fresh local produce. The majority of the shopping for foodstuffs will be done before the trip departs, and fresh goods, such as meats, fruits, vegetables, and dairy products, will be bought en route during the trip from supermarkets, local shops and markets. Breakfasts will generally consist of breads and cereals, if time allows a warm breakfast may be prepared. Many lunches will be provided en-route and will be light meals such as sandwiches and/or salads. All evening meals will be freshly-prepared hot meals, and will consist of a variety of continental and local dishes. Our cook will organize the meal preparation and lead the way here, but will prepare a duty schedule for ensuring a fair, rotating participation from you and your group members in the meal preparation and dish washing duties. Vegetarian meals and other dietary requirements need to be specified prior to arrival. Please note all bottled drinking water will be at your own expense.